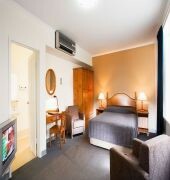 The Directors Studios is located, on the cosmopolitan restaurant precit og Gouger Street. 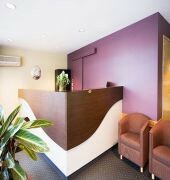 The hotel is within walking distance of entertaiment, china town and the central markets. The Directors studio offers comfortable hotel or studio accomodation, with all studio rooms containing kitchenette facilities. 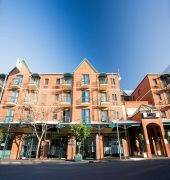 With complementary car parking, the Directors Studio Hotel is a perfect property to discover Adelaide and the surrounding regions.The BreakFree Directors Studios is in the heart of Adelaide, within walking distance of Chinatown, Rundle Mall and the Convention Centre. Adelaide Airport is a 10-minute drive away.The spacious modern studios are open-plan and include a kitchenette.Wi-Fi is available. Private parking is subject to availability. There is a good selection of cafes and restaurants within walking distance of the BreakFree Directors Studios.